GottaCon, Victoria’s gaming convention, ran it’s own Games on Demand this year and it was a big success! The following report is from Mike Gruber, who organized the event. One of our special events this year was called GottaConQuest in which attendees were given quests to complete for each of the six ‘pillars’ of GottaCon: Trading Card Games, Role-Playing Games, Board Games, Video Games, Miniatures, and Panels. One of the RPG quests I came up with was playing in a Games on Demand session in order to claim a badge ribbon. Showing your ribbon at our Special Events HQ then completed the quest. So we had a number of people that were completely new to role-playing play some Games on Demand to complete their quests. It was fantastic! Everyone had fun and I am pretty sure we created some new role-players at the show. Overall GottaCon was a great success and the RPG area saw even more growth than we anticipated. In total we ran 136 individual RPG events (including Games on Demand) for a total of 676 players! Gottacon in Victoria, Canada just had a really successful Games on Demand event, and I think it deserves a mention. It was run by Mike G and Angela Gruber, and the GMs were myself, Patrick Riegert, Todd Nicholas, and Riley Vandall. Mike stepped in as well when he could. Mike tells me we had 70 people go through in three days. Because of some really effective advertising, many of these were first-time roleplayers. It was extremely successful, and will have to be happening again next year. And on that note, anyone in the Victoria-Vancouver-Seattle area, or willing to visit next year, you should highly consider going us. It’s a great time, and I’m sure Mike would agree that we could really use you. And heck, failing that, if you know someone in our area who might be interested next year, let them know about it. 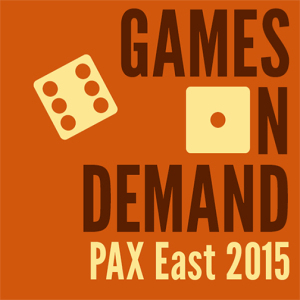 PAX East is this weekend (March 6-8) and Games on Demand will be returning with a crew of enthusiastic volunteers and a ton of great games on offer! Check out the list below to see what we’ll be running. We’ll be starting new games every two hours or so from 12pm-10pm on Friday and Saturday and 10am-4pm on Sunday. Will you be at the show? Come play a game with us! Hey friends! We’re starting to organize Games on Demand for Origins this year! I’m super excited! Last year was such a success, with great friends, food, and games both tabletop and LARP. Are you interested in volunteering? Will I see your wonderful face there? Do you know people who are interested in volunteering? Let me know! I’m sending out organizing emails shortly! Dreamation 2015 is going to be an amazing gaming convention in Morristown, New Jersey, scheduled for February 19-February 22, 2015, hosted by Double Exposure, Inc. The deadline for events is January 4, 2015. The IGX is only for Scheduled tabletop events. For LARPs and LARP-like events, please contact Avonelle Wing as soon as possible, as space goes quickly! As events come in, Michael will put together a preliminary schedule so we can watch the awesomeness grow before our very eyes! If you have already submitted events directly though the Double Exposure website and would like to be considered part of IGX, please fill out the IGX form with the exact same information you submitted, so we can include you. Thanks, and please pass this along to anyone we may have missed. Successful GoD at Dragonmeet UK. We almost certainly could have filled more tables but would have struggled with facilitators. Definitely something to work on for next year. GottaCon is still looking for Games on Demand GMs! Here are some details about a cool new con with a Games on Demand-style event! In 2014, Games on Demand will be run in Boardroom II. TheÂ eventÂ starts on Friday at 1PM and will run until Sunday 7PM in two and four hour slots. If you are interested in signing up run games in Games on Demand, click here. If you would to be a host click here to Join the Wolf Pack.